The dataset, which is part of NASA’s Arctic Boreal Vulnerability Experiment (ABoVE), enables comparisons of changes in surface water extent spanning 20 years. 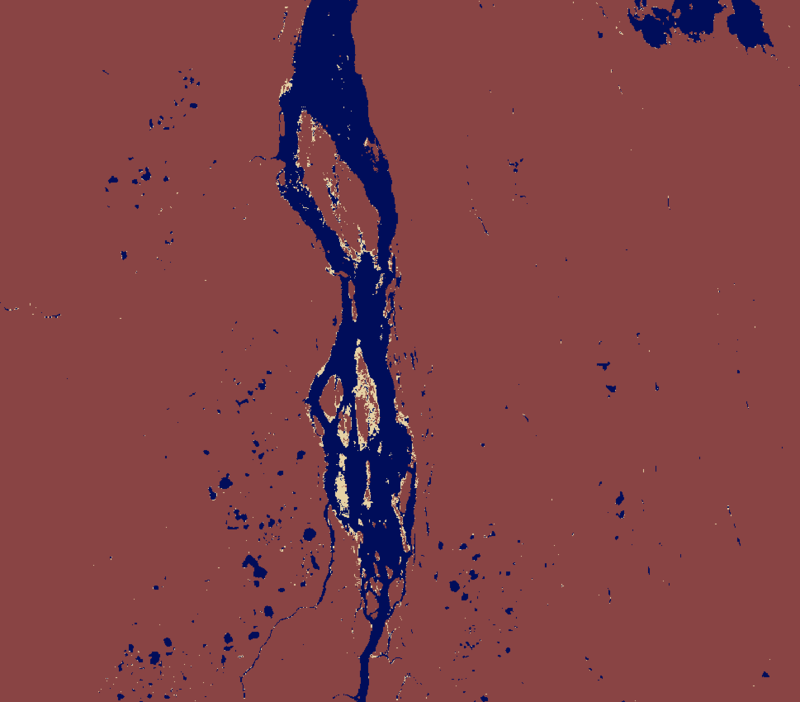 Image of a portion of the Churchill River, Manitoba, Canada, from the dataset showing changes in surface water extent from 1991 to 2011. Areas that were water in 2011 are blue; areas that were water in 1991 but changed to land by 2011 are yellow (such as in the center of the image); areas that were land in 1991 are red. ORNL DAAC image. A recently updated dataset at NASA’s Oak Ridge National Laboratory (ORNL) Distributed Active Archive Center (DAAC) provides the location and extent of surface water for the entire Boreal and Tundra regions of North America and enables comparisons of changes in water extent over 20 years. The Surface Water Extent, Boreal and Tundra Regions, North America, 1991-2011, dataset (DOI: 10.3334/ORNLDAAC/1324) was first released in June 2016; this update corrects spatial reference information for GeoTIFF files and supersedes all earlier data files. The dataset is part of NASA’s Arctic Boreal Vulnerability Experiment (ABoVE) field campaign that is being conducted in Alaska and Western Canada to study environmental change in this region and the implications of these changes on social-ecological systems. The dataset features data covering 20 years in three decadal time steps: 1991, 2001, and 2011, which are referred to as “epochs.” The overall dataset objective is to generate a map of the nominal extent of water for a specific epoch (1991, 2001, or 2011), where “nominal” depicts the representative water extent for that time period. Images for each epoch were generated using at least three years of ice-free imagery from Landsat 4 and 5 Thematic Mapper (TM) data and Landsat 7 Enhanced Thematic Mapper (ETM+) data. ORNL DAAC is NASA’s archive for Earth observing data related to biogeochemical and ecological data and models. The ABoVE: Surface Water Extent, Boreal and Tundra Regions, North America, 1991-2011, dataset is part of ORNL DAAC’s Land Use and Human Dimensions science theme, which comprises 285 topic-related datasets.